With 2 gift certs in hand, I had a plan to share it with my hockey team after our game. We happily headed out to The Main since we won our first game of the Fall/Winter season. Of course, with our luck, the place was packed and we were not in the mood to wait. No problem. There are so many places open along Main street during the late hours. No issues finding another place right? For the love of... Apparently, that wasn't going to be easy. We headed over to Honolulu Cafe and nope, it was full. We skipped nearby Always Seafood because it wasn't that good last time. So we gave Cafe Montmartre a try. Holy smokes, the place was a complete sau na! Have they ever heard of A/C??? 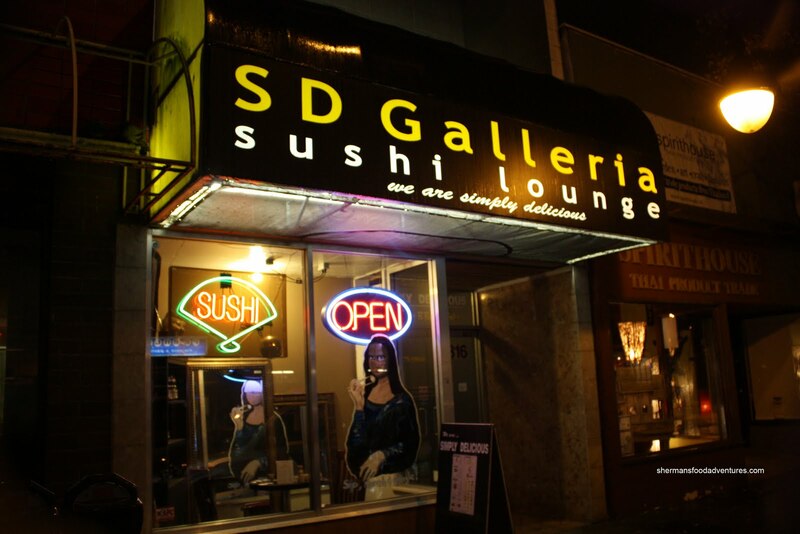 Since we were tired of walking around, we settled on Simply Delicious Galleria and Sushi Lounge. Yes, I've been here before, but honestly, I didn't give much fight. We were hungry and it was open. If you are unfamiliar with the place, try to imagine a club, sports bar and a sushi joint meshed into one complete with attractive staff. With loud thumping house music and a particularly young clientele, one would expect the food to be mediocre. Not so fast. Gordo and I have been here before and we were pleasantly surprised. For a moment, I considered joining the crowd in front of the DJ. However, flashes of that Pepsi commercial about reliving one's youth came to mind. I'd probably creep everyone out. Better not. Just stick to taking pictures of food. Wait. That creeps people out already! Dammit. I'm a creep! Lionel Hutz made sure I realized that. So unlike last time, we decided to exclusively eat specialty rolls and chicken wings. Chicken wings? Yah and they have a few interesting ones too. The first to arrive was the Ying Yang which were kissed with sea salt, pepper and jakuza chilis. 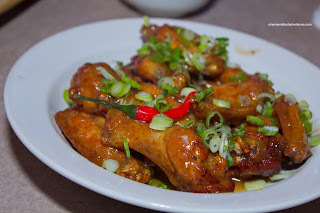 Depending on which piece, the wings ranged from bland to killer spicy. Those peppers were pretty lethal. 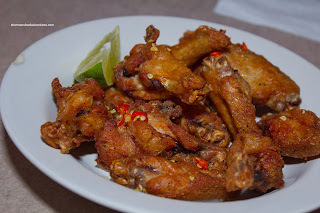 The wings were crispy on the outside and moist on the inside. 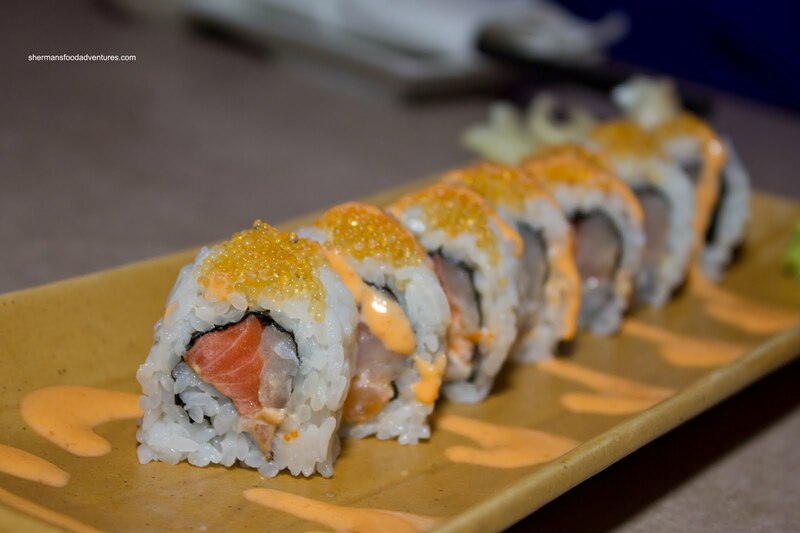 Our first roll was the Golden Rush consisting of spicy tuna, salmon and scallop with golden flying fish roe on top. The roll tasted a bit fishy due to the abundance of roe. There was a decent amount of spice while the rice was on the chewier side. A pretty standard roll really. Our next order of wings was probably the best being the Jappa Wings. These were marinated in their house special teriyaki sauce which boasts 38 different ingredients. I not about to tell you if I could pick out even 10 flavours let alone 38, but there was a good balance of sweet, tart, salty and spice. The wings were large and really juicy inside. 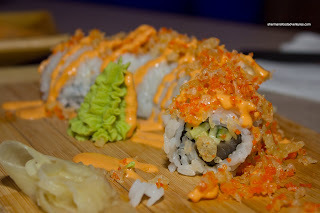 The second roll to arrive was the Crispy Crunch which as the name implies was crunchy from the tempura bits on the outside. On the inside, there was spicy tuna and cucumber. This was not bad with the obvious contrast of textures and the slight spice from the sauce. However, there was really not that much tuna in the roll. We'd probably have to send out a search party to find out. Maybe it was on the dance floor with the others? For our last order of wings, we got the Karaage Wings which were marinated in soy and sweet sake, deep fried and tossed in sweet Asian herbs and garlic. 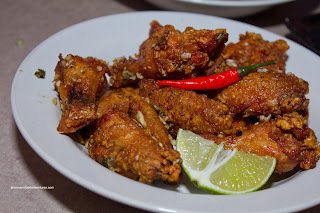 These were crispy, yet moist with a savoury sweetness and slight tang. The flavours were very appetizing. We were very impressed with the 3 different order of wings we tried. 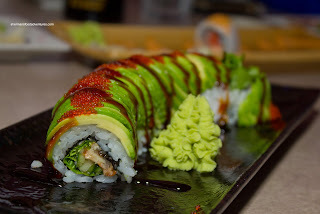 For our 3rd roll, we got an ol' standby being the Dragon Roll consisting of unagi, cucmber and lettuce with avocado and tobiko on the outside finished off with unagi sauce. 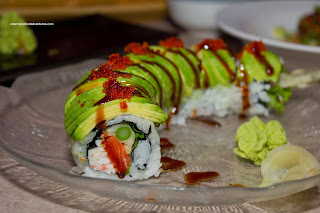 Once again, there was nothing particularly wrong with the roll, however we really had to concentrate to get an unagi hit. It was pretty meager. With that being said, the avocado was ripe and the ingredients were fresh. Then, the Aphrodisiac Attack looked eerily like a repeat of the Dragon Roll except the middle consisted of tempuralized (is that a word?) asparagus, salmon and imitation crab. I'm not sure why this roll would be an aphrodisiac especially considering the narrow asparagus tip. For me at least, isn't it a bit weak on the girth? Just sayin'. Well, at the very least, we were happy that this roll had plenty of filling. Was that the intention then? We were happy with our fill? Hence aphrodisiac? Hard to say... (was that the right choice of words?). 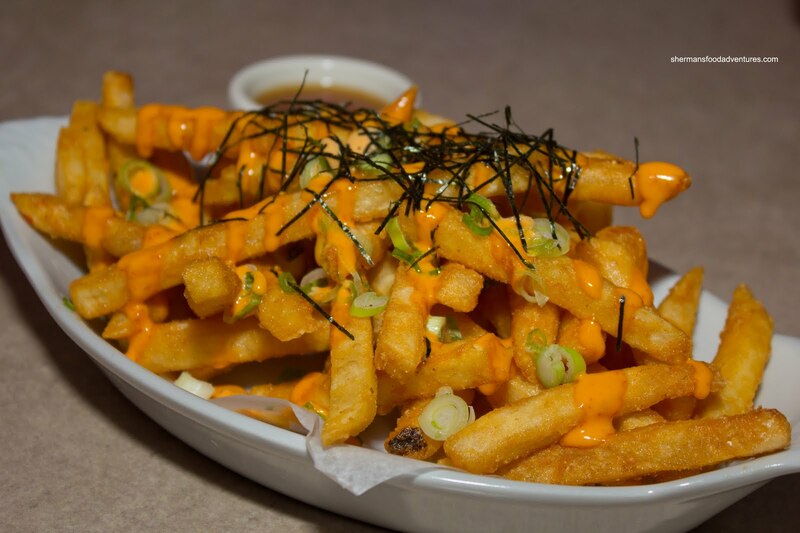 Lastly we got an order of the Jappa Fries which were topped with nori, green onions and drizzled with spicy mayo. Served on the side was a spicy teriyaki dip. Well, I wish there was a better word to describe these, but they were "good". Reminded me slightly of the fries I had from the Roaming Dragon, but better. They were very crisp and there was just enough spicy mayo to add some flavour. The spicy dip was mostly sweet with a slight kick. It went well with the fries though. Ultimately, everyone was satisfied and to a degree, surprised at the decent eats considering the venue and the time. Of course there is better sushi to be had at a multitude of places in town, we know that. 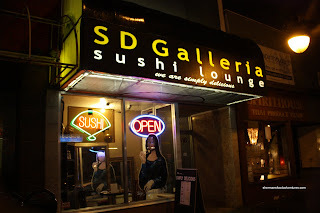 However, the sushi here was good for what they charged. Service was pretty good and pretty (hey, Lionel Hutz wanted me to write that!). Add in a dash of house music, then you have a veritable party with wings and sushi.